1 of 1 Toss 1 peeled, cored and diced Gala apple with 2 tsp cornstarch. Melt 1 tbsp butter in a skillet over medium heat. Add apple, 2 tbsp packed light brown sugar, 2 tbsp water and a pinch of salt. Cook 5 to 7 minutes. Cool and fold into batter with 1/8 tsp pumpkin pie spice. To frost: Beat 1 stick (1/2 cup) softened unsalted butter with 2 cups confectioners sugar, 2 tbsp milk and 3/4 tsp pumpkin pie spice. Spread over cupcakes. Crumble 4 Walkers shortbread cookies and toss with 1/2 tsp pumpkin pie spice. 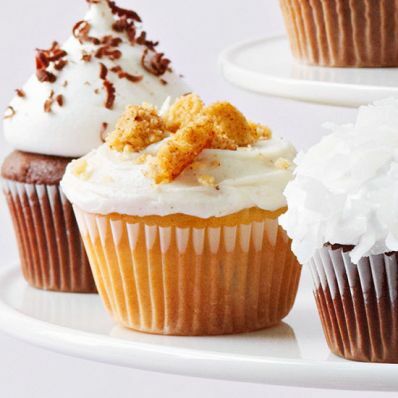 Garnish cupcakes with cookie crumbs.